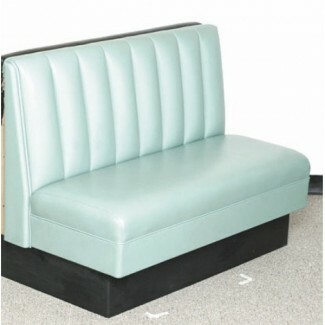 Our high quality booth seating is made in the USA to your specifications. We have custom designed restaurant booth seating for major chains and individual restaurants. We will work with your ideas and preferences to custom-create your ideal booth configuration, complete with preferred frame finish, size, and fabric. All of our booths have a heavy wood frame that is glued and reinforced with corner blocks, as well as a removable spring and foam seat with stabilizer bars, and an all foam-filled back. We realize that different restaurant venues have different needs, which is why we offer a wide array of customizable features on our booth seating. All of our booths are available in several heights and you may choose your ideal frame finish, upholstery, booth shape, and side finish options. **Booth Shape Sizes: 7 Booth Shape Sizes to choose from with various length, height, and depth options to choose from. Please consult with a representative for more details. **Side Finish Options: Both, Left, Right, or Unfinished. **Upholstery: There are a vast array of Upholstery Finish Options to choose from. Please consult with a representative for more details. Laminated or upholstered wipe-away channel. Closed 8" high vinyl base. All foam filled back - different back treatments available, please call one of our representative for details & pricing. Our Channel Back Banquette Collection has a lead time of 3 - 5 weeks from the time your order is processed.